It’s taken a couple of weeks, but shipbrokers are now starting to report that the first demolition candidates are emerging, as ship owners have started this year’s process of renewing their fleet. In fact, 2019 is a critical year for scrapping, given that it’s the final year prior to the IMO 2020 rules, which are bound to send some older vessels for early retirement, due to the fact that it will be uneconomical to retrofit them and keep them in service. In its latest weekly report, shipbroker Clarkson Platou Hellas said that this past week, “has seen many owners return to their desks and fully take stock of their fleet and evaluate which vessels will be invested in but taking into account the new IMO 2020 regulations. We would assume that any vintage tonnage with forthcoming survey renewals will become prime candidates for the recycling market. However, we continue to see, at present, buyers for further use for older tonnage that has been placed into the sales scene on the back of profit-making freight rates. There have been more Owners now probing the market place but are not rushing decisions to sell due primarily to these potential trading buyers dipping their toes into the exchanges and the reluctance of recyclers to offer any aggressive numbers and whilst, there is some appetite from the recycling side, the price levels indicated are far from Owners expectations. We have seen this week a further subdued market in India due to a fall in the local steel billet prices, which in addition, is magnifying the already negative sentiment amongst the local recyclers and in turn creating a lack of support for the prices that some cash buyers are tabling. The one sector looking set to supply more tonnage for recycling is the container market and having being favored by the Indian breakers for many years now, perhaps they may up their game for any of these units made available. We are anticipating a higher volume of container vessels to be sold this year, even to the extent of seeing younger than 20 years old due to the weak chartering rates. We understand that 7 pct of the global container fleet will be 20 years or older by the time 2020 arrives which could create a continual turnover of tonnage supply from this category. Whilst Pakistan remains in complete hibernation for the time being, Bangladesh continues to be the main buying destination. However, with still a significant amount of tonnage in cash buyer’s hands from their pre-holiday acquisitions, the outer anchorage at Chittagong could be filling up soon which will test their financial and demand limitations as cash buyers may have to take their losses and dispose of their units should the Pakistani and Indian buyers maintain their stagnant stance”, Clarkson Platou Hellas concluded. 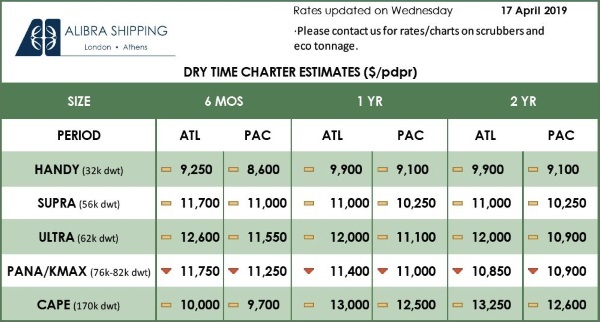 In a separate report, Allied Shipbroking noted that “few new deals were noted last week in terms of ship recycling, with owners being reluctant to proceed in any early retirement of their vessels, as they are still expecting to reap from the positive trends most are expecting to see from the freight market during the first quarter. 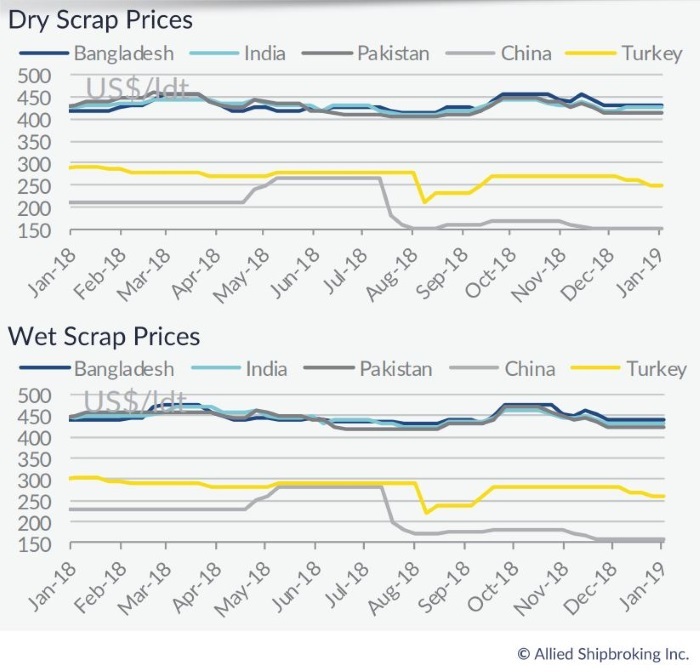 In the dry bulk segment, very few vessels were sold to be scrapped this past week, with most notable being the deal of a Japanese built Capesize which went to Bangladeshi buyers. However, this overall trend can turn around and activity could quickly pick up in the case that the freight market continues on its current negative pattern over the coming weeks. 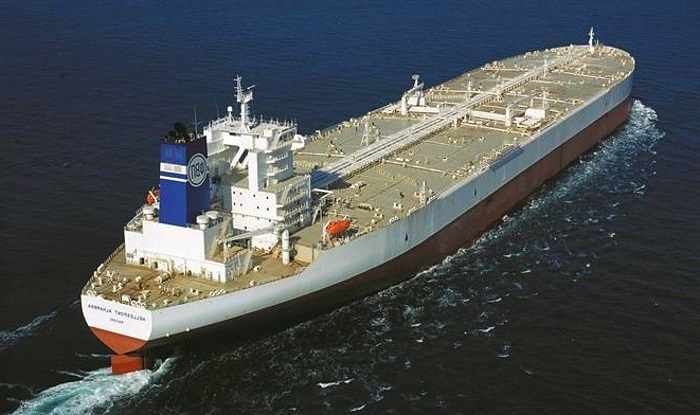 In the tankers sector, things were even more quiet, as there was no reported activity to speak of, with the market outlook remaining healthy, especially for the product tanker segment, making the idea of scrapping less appealing to owners right now. With regards to demolition destinations, interest amongst cashbuyers in the Indian scrapyards seems to have diminished considerably last week, due to lower local steel prices and deterioration of the Indian Rupee. However, things may improve coming forward, as investments have been made by domestic breakers in order to obtain green recycling solutions”, Allied said. Finally, GMS, the world’s leading cash buyer mentioned in its latest report that “instability seems to be the key word in the subcontinent markets this week, with all locations precariously poised and seemingly heading downwards, as 2019 embarks on a rather negative and tentative start. As it has been for several months now, Pakistan remains an inert and inactive force, positioned well behind their subcontinent competitors, India suffers another volatile week of steel reversals, and finally, Bangladesh remains holding up the rest but is swiftly filling up with the plethora of unsold Cash Buyer tonnage that is gradually being fixed to local Buyers on a weekly basis. Supply – particularly in the container sector – is also starting to pick up again as Ship Owners return from their holidays. Certain chartering markets have shown few signs of improving and this situation is expected to stagnate for some time now, as fears over an ailing Chinese economy fuel further uncertainty across global markets. The average demolition price for the year still remains historically high. 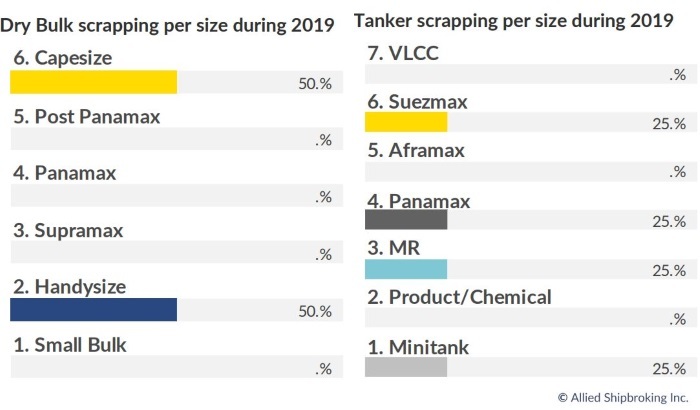 Bulkers and tankers averaged an impressively firm USD 440 – USD 445/LT for much of 2018. Moreover, the ongoing shortage of dry bulk units has pushed bulker prices up, subsequently narrowing the margin with tankers once again. 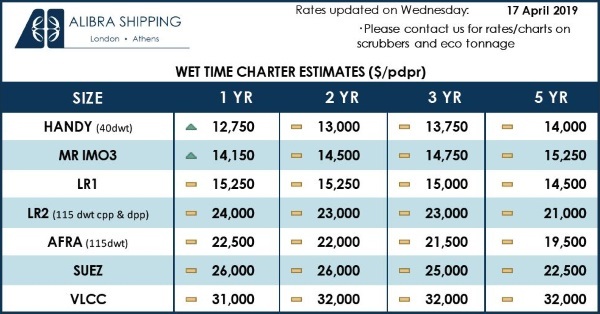 This compares rather favorably when compared to 2017 levels, when the average recycling price for bulkers was roughly USD 365/LT and the average price for tankers was region USD 375/LT. As a matter of fact, if we evaluate prices going back to 2012, we see that USD 390/LT has been the average price for bulkers, whilst USD 404/LT has been the average price for tankers over the last 7 years. As such, 2018 certainly delivered impressive returns to the ship owning fraternity”, GMS concluded.